Vintage Home & Garden: Extreme Home Makeover...watch Sunday night! Did I ever tell you ABC came to town this summer? They were here for a week to film an episode of "Extreme Home Makeover" and it is going to air THIS SUNDAY! This episode features a family that lives on a farm outside Lena, IL. My parents live in Galena, IL so I have been passing by this old farmstead on the way to their house for 15 years...never dreaming I would be there when it got such an incredible makeover! But I am sad to say Ty never really left his bus except to shoot his scenes. Paige and Pauly were saying he had "gone Hollywood" and didn't hang out much with the crew anymore. I really hope they were joking, because I was sad to hear that. Everyone else was so accessible. You could just walk right up and talk or knock on their trailer door. Ty was the only one with a big tour bus. It sat away from all the others...but I will give him the benefit of the doubt. He must have a lot on his plate hosting the show...so he was probably busy in there and thats why he didn't "hang out" much. But really...when Ty was out and about...he was just as cute as ever. This is the family that will be featured in the episode...the photo is from right after Ty did the screaming thing to get them to come outside. A super nice family, just trying to make their way in the world and live their dream of owning a self-sustained organic farm. Sidelined by an unexpected illness and a devestating fire, they thought all hope was lost. But, that was until ABC swooped in and rebuilt that dream. I have so many photos I could post, but I can never figure out how to get them out of my phone and into my email. If there is anyone out there that has owns a Verizon EnV2, and knows how the heck to use it...please help a girl out! I am clueless when it comes to this sort of thing. Pauly is always one of my favorites...so fun and real. Just a down-to-earth regular guy. Although, I will say he hates it when all the women flock to him. Lets just say some of the volunteers got a little "friendly" during the week. He is not flattered by it. Hates it. I like that about him. Oh, and the designer was Paige. LOVE HER! She is so cute...and let me say t.i.n.y in person! Is there such a size as a -2? If so, that is her size. She would turn sideways and you would think she left the room. Oh, the secrets I could tell about this experience! The ins-and-outs...the behind the scenes things that are sooooo different from what you see on the show...and lets just say the group from Extreme Home is a little...wild! Shhh...I didn't tell you this...but there were mornings when they came on set straight from being out the night before! woohoo! I lead quite a boring life, so that is a whole different world to me! Oh...and I forgot to mention...David Duchovney stopped by. 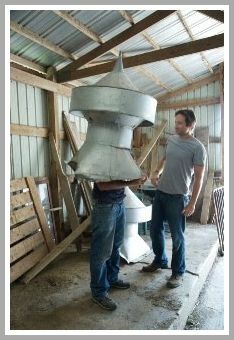 That is him on the right...and I someone mocking and alien with the cupola from the barn...love it. I don't want to give away too much about the house so I am not going to post photos of it. For those of you that are going to watch this Sunday, I figure it would be like telling the end of a movie. I will say the house isn't as "grand" as they usually are, but still wonderful. Which I think is a good thing, there is always so much wasted space. The family wanted a comfortable home, but a more conservative size than they usually are. They were worried about taxes, etc. I have heard there are several families that have lost their homes to forclosure after mismanaging their new found equity, so I thought that was a good thing. I will say this...some in that family better love the color yellow...a LOT! I don't mean a soft, butter yellow. I mean yellow-yellow...as in Big Bird from Sesame Street. I guess it is just not my thing. I was a little shocked at their use...or should I say over-use...of this shade of yellow. They said it was because it was special to the family. I sure hope so. But there is a fabulous butler's pantry...I have always wanted one. And watch closely for the furniture. A friend of mine worked alongside Pauly all week building most of the pieces. And dare I say....look real, real close for a few pieces of white painted furniture, too! Don't they look like they were plucked straight out of my booth the Kane County Flea Market?! Hmmmm...could they be??! I'm not telling...wink..wink..but I really need to get my Etsy store loaded up, don't I?? Don't forget to tune in. I want to hear what you have to say about it on Monday! I need reassurance I am not the only person out there that is not a fan of Big Bird Yellow on a gorgeous farmhouse! Oh I'm so excited to see this now. I have to remember to DVR! Very cool!! Can't wait to see it! With my Verizon phone, I just e-mail pics to myself as a pic message. and so cool that you got to work on the set. That's soooo crazy, my brother & sister-in-law live in Lena and he was telling me all about this! Oh Mary that's soooooo cool...how fun!!!!! !